An essential piece of cooking equipment is knowing when your food is done. Whether it be an expensive tenderloin or a pork shoulder. Why would you chance ruining the meat when you can know in seconds where your at with the internal temp. I just bought two. One for the house and one for the dock. Thermoworks is regarded as the best on the BBQ circuit and this is a fantastic buy. Here’s the link to the private sale. you only get notified if you’re on their mailing list. I happen to be on their mailing list so I shared the link for you to score one or two for yourself! Craig and I visit Humphrey’s Smokers Manufacturing plant to pick up his customized searing station. three options $30, $35, $40 for 14, 18 or 22 inch Weber grills. A charcoal ring that turns Your Weber charcoal grill into an efficient oven and slow roaster. Now cook whatever you can dream of! It is rare in today’s world of cheap offshore products to find something that is made better than expected and still sells for an affordable price. Actually, that is only partially true … even some so-called “luxury” brand products are now being made offshore and are made to the cheapest standards, yet they still sell for a luxury price. At the Amazon price of under twenty dollars I had low expectations for this grill cover. There were ones selling for much more and others with the famous brand name on them selling for about the same price. I was more interested in short-term protection for my shiny new kettle grill than I was in saving money … after all if it was a piece of junk I could buy another when necessary. I read the reviews of the famous brand and so many reviewers were making statements like “you would be just as well off using a plastic garbage bag”, but the photos and description of this cover from Classic Accessories somehow just looked better than average. And it is. As soon as I unpacked it from the box I could tell it is better. It feels heavy-duty and immediately looks better than anything I’ve seen in the stores (and some of them sell for more than twice the price). The cover is made of a heavy canvas-like cloth material backed with an equally heavy-grade rubberized weatherproofing. All of the seams are sewn evenly and look very strong. I placed the cover over my new Charbroil grill, which is a 22.5” model but because of its shape is larger than some other grills, and the fit is perfect … it looks like it is custom made. The length is exactly as illustrated by the manufacturer on this page, almost touching the top of the wheels. The cover has two heavy-duty handles to help remove it, sewn-in waterproof air vents and strong click-lock leg wraps, plus a tough locking drawstring. I live in a very brutal climate area, especially in summer, and I have come to learn what can survive the weather and what won’t. I predict I will still be using this cover 5 years, maybe 10 years down the road. And the cover’s color scheme is attractive. No longer am I hiding my grill in a far corner but I’m leaving it right in view in the corner of the patio where the desert sand color helps it blend in with the ambient surroundings. The seller’s description is one of the better ones I have seen at Amazon, complete with a handy measuring aid. Everything is exactly as represented and the cover easily earns 5-stars for its high quality and great value for the price. 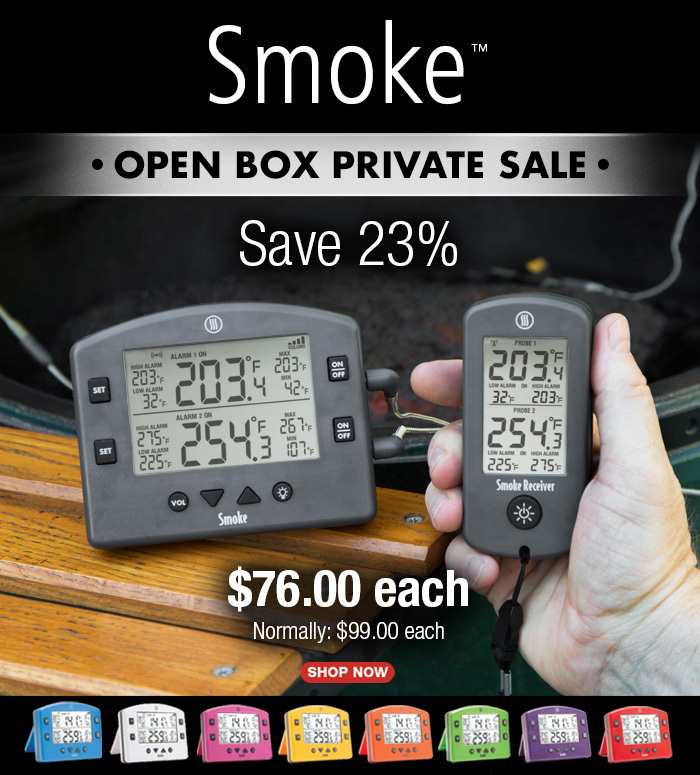 Big Time Private Sale Alert On The Thermoworks Smoke Right Now! By subscribing to the Thermoworks list you get special offers that are not offered on their main page. My good friend Joe Ball alerted me to a big sale on a commercial grade remote thermometer- the Thermoworks Smoke. I’d always used a Maverick 732 which is a decent consumer grade remote thermometer that retails for around $60. The Thermoworks Smoke is professional grade. The build quality is conservatively speaking about three times greater and it can be had for $79.99 including shipping. I can’t stress enough how good of a unit this is. if you have a grill master in your life, trust me buy this and put it away for a birthday or Christmas and they will love you for it. While not the same as new, all units are like-new and include the full warranty. They include Smoke, Smoke Receiver, Pro-Series High Temp Cooking Probe, Pro-Series High Temp Air Probe with Grate Clip, and operating instructions. In most cases, you won’t be able to differentiate these from new stock. Limit 5 per customer. Hurry! Back up the truck! Home Depot. .265 cents per lb for charcoal is right there with the cheapest you’ll find all year. When I pulled this Cast Iron Griddle out of the shed to cook swordfish on the Charcoal Weber Go-Anywhere I figured that I’d probably have to drape it over the sides of the grill. Here’s a link to buy it on Amazon It’s $35 and that’s a steal for how versatile it makes your grill! When I checked, it fit perfectly in the groove where the cooking grate would go without any need to modify it. It’s like a stock accessory. Not only that but has enough space open on the sides to allow air flow to the coals to get that cast iron piping hot for searing. THIS MAY BE THE BEST PORTABLE CHARCOAL GRILLING SETUP EVER!!! As you can see it fits perfectly inside the grooves where the cooking grate would sit. It doesn’t impede the lid from closing , the lid still latches on the edge of the back of the grill. I swear when they designed this griddle they had to be thinking of the Weber Go-Anywhere!